Carrier has a strong reputation in the HVAC industry – one that’s been built up for more than a century. Carrier has one of the industry’s most impressive histories, as its founder, Willis Carrier, is considered the father of modern air conditioning. Today, Carrier’s products are still noted for their quality engineering and advanced features, backed by a robust support and distribution network. 1. The Comfort Series – Carrier’s Comfort Series consists of the brand’s economy models, but it’s important to note that economy doesn’t mean a lack of quality. 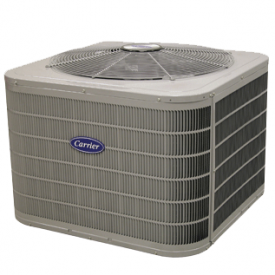 Reputable HVAC manufacturers like Carrier do not use inferior components in their economy models. The same reliable engineering is found in these HVAC units, so they are expected to last as long and function as well. 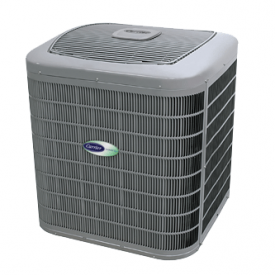 In a typical case, a quality HVAC system like a Comfort model will last at least a decade, and Carrier ensures this with a 10-year warranty. The Comfort Series can still achieve SEER ratings of up to 16. A 16 rating exceeds federal regulations by a considerable margin and far surpasses most existing residential systems. SEER is a single number metric that signifies how energy efficient the unit is. SEER ratings are calculated by measuring how much the system offers per unit of energy spent and attempts to simulate the kind of loads expected during the summer months. On top of an impressive SEER rating, the Comfort Series is built with a filter drier system that removes contaminants during operation, keeping them from entering the home. Further, the Comfort Series is compatible with Puron refrigerant, which is a non-ozone depleting option. Every Comfort Series model is also finished with Carrier’s WeatherArmor protection, which comes with a galvanized steel cabinet and a baked-on powder paint coat. The powder coat is particularly valuable in regions where heavy humidity and airborne salt is present, as it offers additional defense against corrosion and other environmental stressors. 2. The Performance Series – The Performance Series is the next tier up from the Comfort Series and can achieve SEER ratings up to 17. Like the Comfort Series, the Performance Series comes with a filter drier system and the brand’s WeatherArmor coating and design. 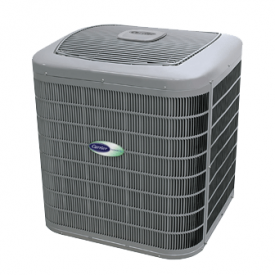 The Performance Series comes with a two-stage compressor that allows homeowners to choose a low or max capacity option when cooling. At low speed, the unit provides efficient cooling and humidity control, which is suitable for most warm days. When the weather turns hot, though, the compressor kicks into high speed mode, prioritizing rapid, powerful cooling. Advanced humidity control is also available with the Performance Series if a compatible thermostat is installed. Like the Comfort Series, Carrier provides a 10-year warranty with most of the Performance Series’ components. 3. The Infinity Series –The Infinity Series is Carrier’s most advanced HVAC system and delivers a host of features, as well as additional efficiency. The Infinity Series outputs SEER ratings up to 21 and comes with all of the engineering features built into the Performance and Comfort Series. Carrier’s 10-year warranty is also provided with the Infinity. Where the Infinity really stands out is the addition of Greenspeed Intelligence, Infinity System Control and the Silencer System. The Silencer System reduces operation noise considerably, cutting sound levels down to 56 decibels, which is about the sound of a normal conversation. Infinity System Control allows homeowners to control their air conditioner from any device or from a smart touchscreen, and it can be used to define zones in the home for custom temperature and humidity control. Greenspeed Intelligence, along with an inverter-driven compressor, allows for fine capacity control with the unit. Greenspeed kicks in automatically and subtly changes compressor output to respond to changing temperature or humidity levels, ensuring the optimal mix of energy efficiency and cooling. This is similar to the variable speed compressors found in other brands’ premium HVAC models, and it ensures an optimal combination of energy efficiency and cooling. Greenspeed Intelligence is also handy for maintenance purposes, as it will alert the owner when a component is nearing the end of its life. Any responding technician can also pull data from Greenspeed to determine what type of maintenance is required. This can save technicians a lot of time and ensure the Infinity is never offline for long. Carrier has been making HVAC equipment for more than 100 years, so its technology, manufacturing and support are thoroughly proven. 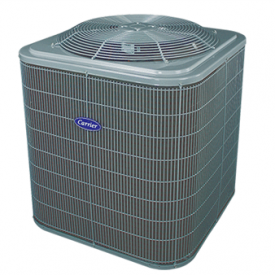 If a reliable and durable HVAC system is what’s needed, Carrier is a solid choice.